The green Yatir vineyard abuts the arid Negev Desert . Film still courtesy Yatir Winery. The Yatir Winery, an independent subsidiary of Carmel Winery in the Negev Desert, produces some of the finest wines in Israel. Grapes growing in the desert? It would seem that David Ben-Gurion’s famous notion of making “the desert bloom” is coming to fruition. Yatir was founded in 2000, as a joint venture between Carmel and the grape-growers of this region of the desert—which, because of its altitude, can get quite chilly at night, and even snowy in the wintertime. 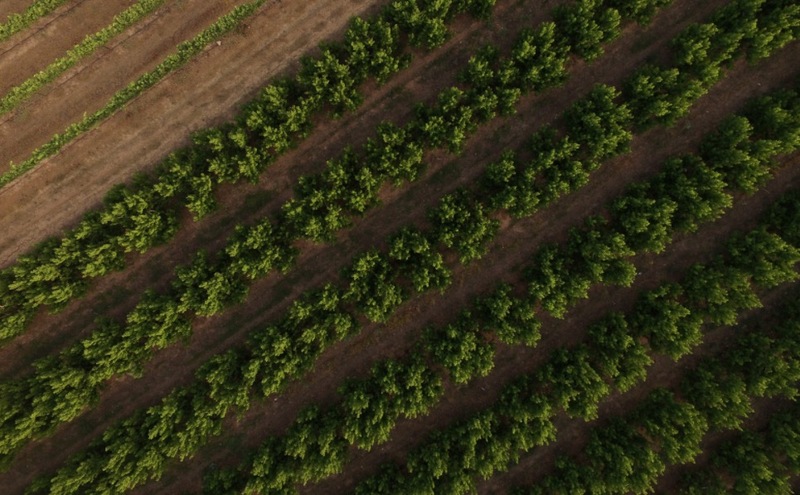 The Yatir Forest grapevines grow three thousand feet above sea level in rows, surrounded by the largest planted forest in Israel; here pine, carob, and pistachio trees all play a role in creating this unique terroir. In the forest the air is moist, the trees fragrant. The earth here is rich with chalk and clay, and the drainage is very good—the grapes love it. But what about the wine, you ask? Uncork a 2006 bottle of Yatir Forest—Yatir’s flagship wine—with its signature red seal stamped with the face of a lion and let it breathe for a while before pouring a glass of the crimson liquid, with its bouquet of ripe black currants and Mediterranean herbs. The wine is superb. And, as you sip it indulgently, you may taste the terroir of the desert, filled with wonders.